Osteoarthritis (DJD) is the most common and most frequentlty disabiling of the joint disorders. OA begins in your 30s and peaks between 40-60 years of age. By 40 years of age, 90% of the population have degenerative joint changes in their weight bearing joints, even though symptoms are usually absent. 50% to 80% percent of the elderly population have OA. OA effects an estimated 26.9 million US adults while 409,000 hospitalization where accounted for as a primary diagnosis in 1997. OA of the knee is 1 of 5 leading causes of disability among non-institutionalized adults. Some risk factors for osteoarthritis include age, obesity, previous joint damage, frequent occupational or recreational repetitive use, and plain old genetics. Symptoms include pain, morning stiffness, instability or buckling, limitation of motion and locking of a joint. OA often occurs in weight bearing joints (hips, knees, cervical and lumbar spine) and in the fingers and knuckles. There are no medical treatments that stop the degenerative process. But preventive measure can slow down the progress. Certain over the counter medications, such as acetaminophen (Tylenol), NSAIDs (Advil, Aleve) and other prescription medications can alleviate the symptoms of osteoarthritis. So can the exercise prescription. What is the exercise prescription – just what it sounds like! Daily exercise prevents early cartilage degeneration and maintains normal articular cartilage. By combining strength training and low impact aerobic exercise you can slow arthritic progression and reduce pain – all without a single pill! Of course, results will vary for everyone, and we’re not telling you to forego medical treatment. But you just might be surprised at how much better exercise makes you feel. Never exercised before? No worries! DHAC caters to fitness enthusiasts and newbies alike. Visit us to learn more! A woman recently commented to me that she thought the fatigue in her legs was a “natural consequence of getting older”. Turns out, this the real cause of her leg fatigue was venous insufficiency. Good news? Absolutely. 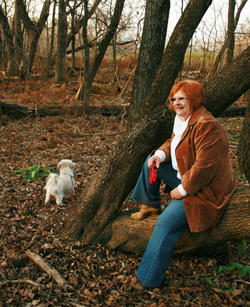 She can wave goodbye to that fatigue with a minimally invasive outpatient procedure to close down the nonworking veins. Chronic venous disease of the legs is one of the most common conditions in the United States, present in up to 60% of the adult population. Of these, 20-25% of women and 10-15% of men will have visible varicose veins. Many people with venous insufficiency do not have visible varicose veins. Many of these people suffer symptoms such as leg fatigue, aching, throbbing, heaviness, cramping, restlessness, and swelling. These symptoms can interfere with level of daily activity and impact quality of life. Do you have visible varicose veins? Often times, these visible varicosities are “fed by” insufficient veins that are deeper under the skin and can only be seen with ultrasound. These underlying veins that do not work properly need to be evaluated and treated first in order for the varicose veins to be safely and successfully eliminated. Do you have symptoms in your legs? Do you have visible varicose veins? Mass Vein Care is conducting a free screening event on November 8th from noon to 8PM at Dedham Health and Athletic Complex. Come for a free ultrasound to screen for venous insufficiency and learn about treatment options that may help improve the quality of your life. To reserve a time-slot for a screening ultrasound, call 1-866-442-7796 or stop by our practice site on the second floor on November 8th. Think You Can’t Run a Marathon? How many of us aspire to running a marathon? We’d love to, we think to ourselves, but who has the time to train? We have to go to work, feed the kids, take out the dog. Don’t we deserve a little downtime at the end of the day? Tell that to Phillip Lussier. Phillip is a patient of DHAC Physical Therapy with a neuromuscular condition. He has trouble walking, taking stairs, and performing everyday tasks. Together Robert Perednia, his Dedham Health Physical Therapist, and Meghan Johnson, former DHAC physical therapy patient and intern, Phil recently participated in the Newport Half Marathon. 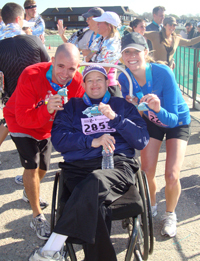 On October 16th, and using a wheelchair donated by the Mass Hospital School, the trio completed the entire 13.1 mile course. Even more inspiring, Phil stood, and with Bobby’s and Meg’s help, walked the last 100 feet across the finish line. All 3 had a great time during the race with people cheering for Phil the entire way. None of three participants had ever run a marathon before. Yet, they teamed up to help Phil achieve his goal. Still think you can’t run a marathon? Tell it to Phil Lussier.